Statement of His Holiness the Dalai Lama on the 10th of March 2002 read in front of Potala Palace exhibit. May (4) Protest Demonstration to Commemorate 55th anniversary of takeover of Inner Mongolia. Visitors will encounter few lineups at this Florida-based fantasy land offering the country's historic landmarks in miniature. 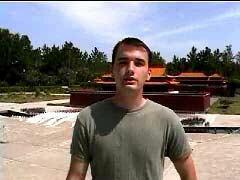 (28) Falun Gong Speaks Out ! resident of Central Florida and Falun Gong practitioner. 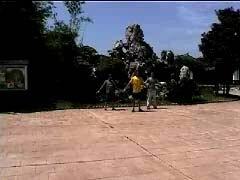 In front of the TianAnMen Square exhibit at Florida Splendid China. 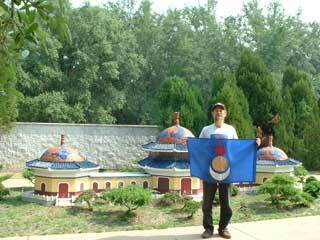 In Suzhou Gardens Show Area at Florida Splendid China. Demonstration coverage at corner of US-192 and Formosa Gardens Blvd. Splendid spin on resort: Bull from the China shop? December (14) Protest Demonstration to commemorate 9th anniversary of the Grand Opening of Florida Splendid China. People, fun and politics clash at a Communist-owned theme park in Florida. Since the establishment of the Splendid China park in 1989 in Shenzhen, the special economic zone in South China's Guangdong Province, more than 1,500 theme parks have been built across the country, featuring art, ancient culture, plants, animals and more. 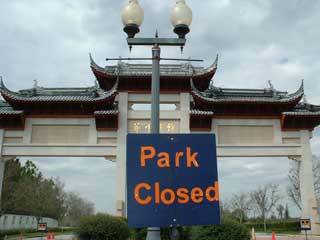 Despite the varied themes, those parks have one thing in common - artificial scenery or the cloning of scenic spots. Most theme parks are low-quality and repeat the same theme. It is estimated that there are more than 70 parks related to the Chinese literary masterpiece "A Dream of Red Mansions" and about 500 associated with the novel "Journey to the West." Some parks even lack good taste. Attention should be paid to the impractical construction of theme parks regardless of current conditions. Of all China's theme parks, only 10 per cent make a profit. But the construction of many more theme parks is still being planned. 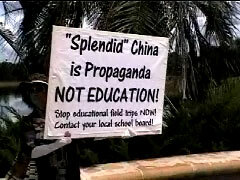 Nearly 10 years ago, Splendid China opened amid boasts about its $100 million addition to Central Florida's tourism lineup -- and complaints from a group of anti-Chinese-government protesters. More than 100 Lake and Sumter students in grades seven through 12 will participate in Lake-Sumter Community College's Educational Talent Search Summer Tour program. .. Talent Search is a program developed by the U.S. Department of Education in 1965. Dec. (31) Florida Splendid China closes it gates for the last time. February (20) Visit to investigate the closure of Florida Splendid China.